As I write this, I'm sitting in my hotel room in Takayama, at the table, on the floor. And I can't help but write down my experience of tonight. After a week in Japan, I was pretty let down by my vegetarian options. I mean, I knew it was going to be difficult. But after a week, I was pretty fed up. But luck was on my side. In a small country town, in the middle of the Japanese alps, was a vegetarian-friendly restaurant – who knew. Not only did it cater to me, but it had a VERY good rating on TripAdvisor. Like most Japanese restaurants, Heianraku is unassuming from the outside. Just a wall and a closed door. No menu. No windows. On the exterior, a sign permanently reads 'fully booked'. Tip number 1, get your hotel to book you a table. As we walked through the door I was a little nervous what we would find on the other side. A closed door to a restaurant to me feels really unwelcoming, so I went in thinking the worst. But as soon as we entered we were warmly welcomed by an enthusiastic, smiling face who was very happy to have us. Heianraku is a small restaurant that seats around 12 people max. Most of the seating is at the bar, which overlooks a thin kitchen area and gives you the opportunity to get to know the owners. 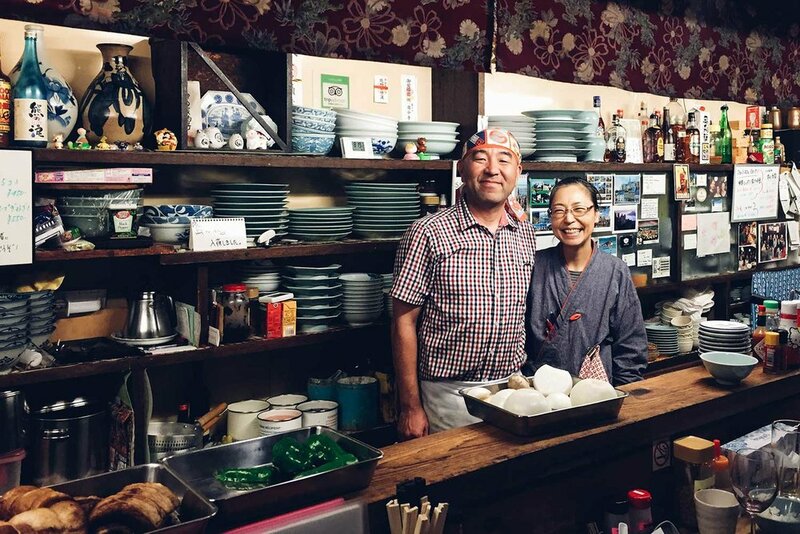 It's run by husband and wife team Hiroshi and Naoko, they make the restaurant feel like home – maybe because technically it is their home. The restaurant's walls are littered in postcards, photographs, trinkets and presents from customers who had obviously felt absolutely touched having been welcomed into their little family for a night. My favourite was an old atlas signed by hundreds of travellers from all over the world. The permanent sign saying 'fully booked' was a question on all our minds. And when we asked why they leave the sign up when there's only 6 of us total for the evening, they energetically said, 'because that's enough!'. Simple living sprang to mind and I realised how happy they both were – certainly happier than most people I know at home. And yet, they have so much less. The atmosphere and warm welcome wasn't the only good thing, but you'll be pleased to know, the food was incredible. Tip number 2, order the dumplings – pork or veg – it's honestly the best Josh or I have ever eaten. My whole night had me smiling ear-to-ear. I wanted to stay there long after they closed, drinking beers and talking to Hiroshi and Naoko. They were interesting, sweet and very funny – Naoko even jokingly bowed to the 'God of Vegemite', one of the many presents she'd placed on a shelf. The night got me thinking about the connections you make so far from home. Learning how others live, about their religion and culture. Something you'd never be able to experience anywhere else. It's incredible how important human connection really is. And although I'll go back to my hotel room and eventually back to Australia, I'll always remember Hiroshi and Naoko, who made my time in Japan that little bit more special, by opening up their home to me and sharing their food, their life and their love with me. If you find yourself in Takayama, don't forget to book a table. What's your fondest travel memory?